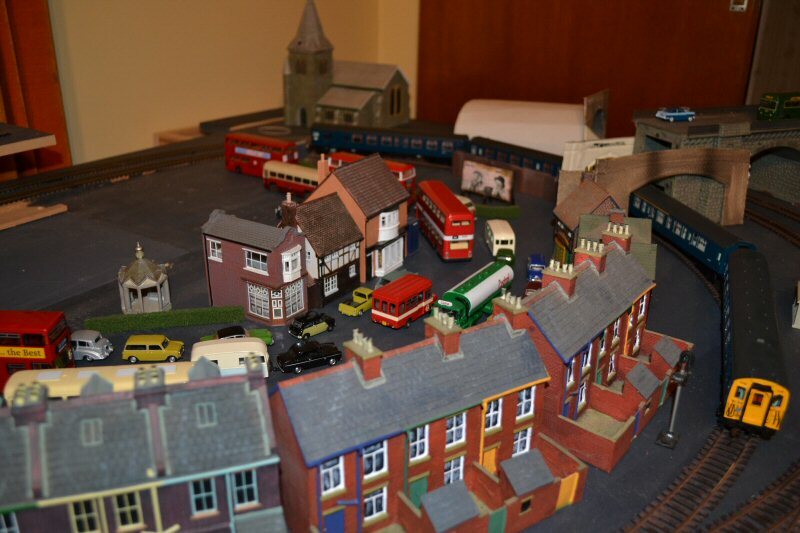 No, the station buildings are from Bachmann Scenecraft straight out of the box. I was going to scratchbuild them to that style, then Bachmann very conveniently announced they were going to make them! I do intend weathering them eventually. The platforms will be built properly in due course - the plank off-cuts are merely place holders. Very nice Jeff, it's come along a bit since I last saw it. Hopefully I'll see it at the next meeting. Hi Neil and welcome back to the rea world!! Hope you had a good trip. We'll look forward to seeing you in July, or pop around earlier if you feel like it, perhaps while checking progress on the new house. Surprised we didn't see you at Doug's BRMA meeting last weekend. I hope to have a little more progress for my meeting but I can say with reasonable certainty that I will not have got the upper circuits completed by then! Hi Jeff, I just got back on Sunday morning so just missed Doug's meeting. Still very jet lagged and Sarah's working this weekend. So I'll see what's happening the following week. 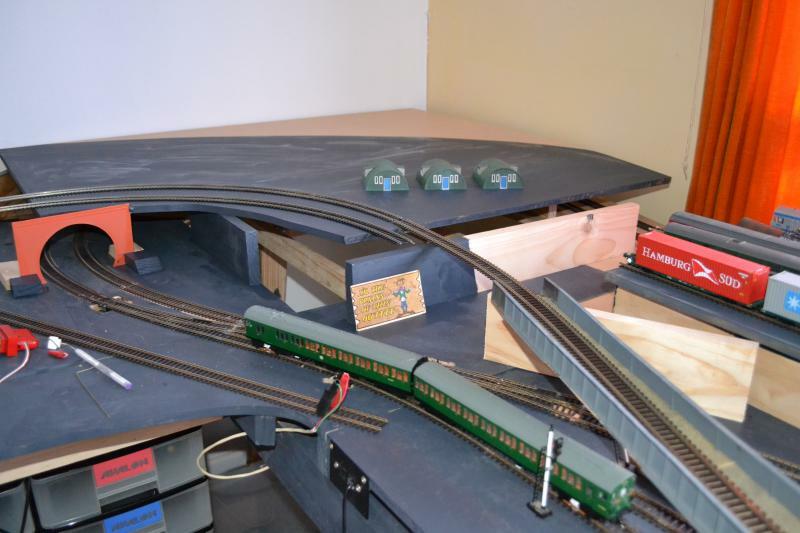 Certainly looks like loads of progress has been made on your layout. Still thinking about mine. 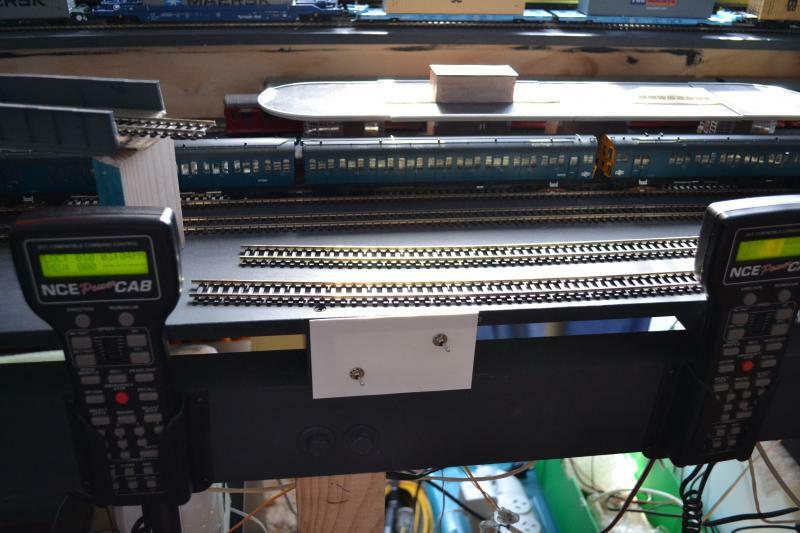 I have just spent most of the evening, after work, rewiring and soldering two DPDT switches in to the track feeds, to allow me to connect a DC controller to each track. 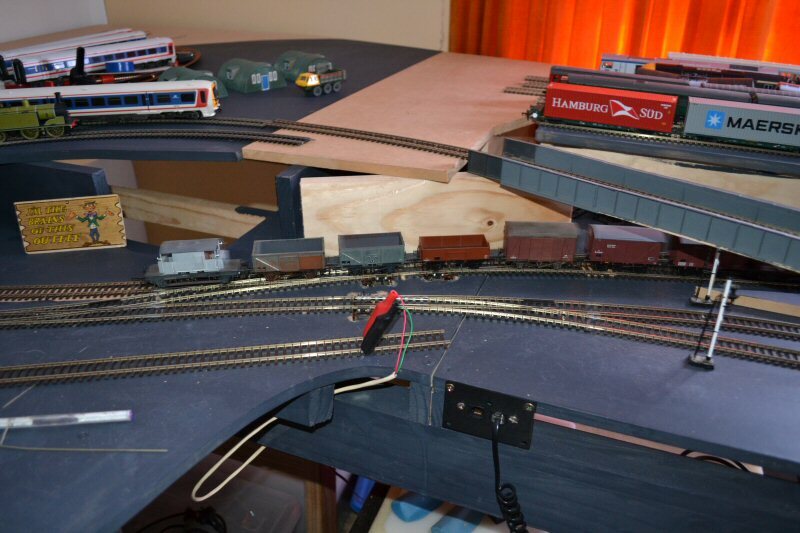 There are no isolating switches at this stage and the DPDT switches were what I had to hand and don't have a centre off position - ideally, when I set up the conrol panel, I'll add even more wiring to allow each section of track to be isolated as well as being able to switch each circuit to DC or DCC. The DC controller will be an old but very reliable Hammant & Morgan Duette. The reason for all this is that I am now hosting a BRMA meeting on Saturday 16th July. I volunteered at short notice because the original host, my very good friend Roger T (BRMA members will know who I mean) suffered a heart attack at the Brandon Park exhibition in June. While he is recovering well, we thought it was not wise to put on him the extra strain of holding the meeting so soon after the event. Incidentally, I bought the previously mentioned H & M Duette off of Roger a good many years ago. While I am not entirely ready to host, I'll manage to fumble through. 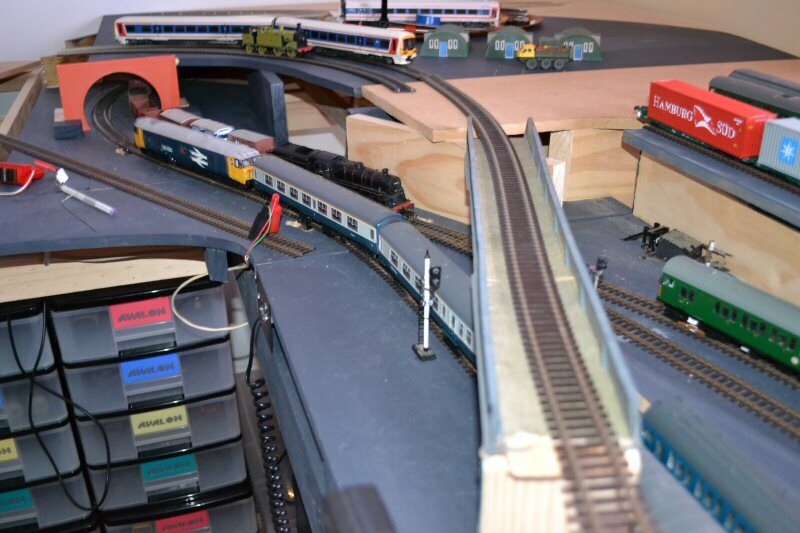 The main thing is that the trains are operable and if anyone brings a normal DC locomotive along, I can still run it, although it means clearing any other locomotives or motorised items off the selected track.No further photos at this stage - I don't really want to show off the tangle of wires!! As I refine things, though, I intend to tidy the wiring properly. At least the colour-coding helped me to do the reconnections without too much difficulty. If I get the chance, I hope to cut the next bit of the upper section before the meeting. I may even get some paint on it beforehand, if I'm lucky! Additional: I have now completed and tested the wiring for the DCC/DC changeover and all is now ready for tomorrow's meeting! Hope it all goes well today then Jeff. Thanks Ron. 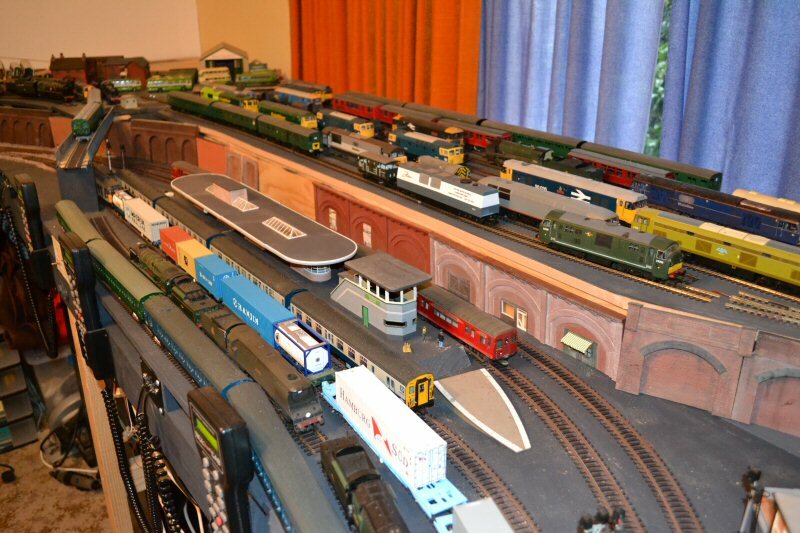 We had nearly 20 people here today and the layout behaved perfectly, including the DC operation. 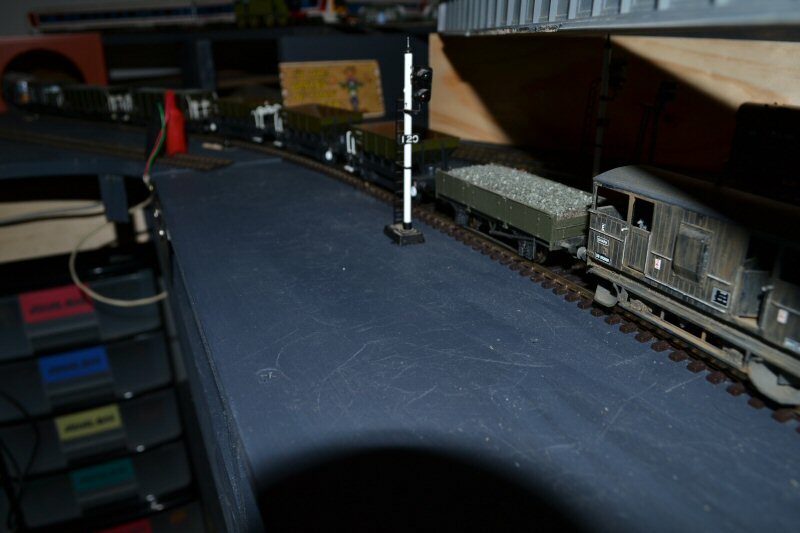 I got to run Rick's (gwiwer) new weathered 2EPB for a while. It made an interesting contrast to my pristine green EPB which arrived two days ago but to which I only fitted a decoder last night. Mine was actually still doing a running-in turn as the first guests arrived. This morning, before anyone arrived, I trimmed the upper board at the end to nearer the correct shape and part-painted it. 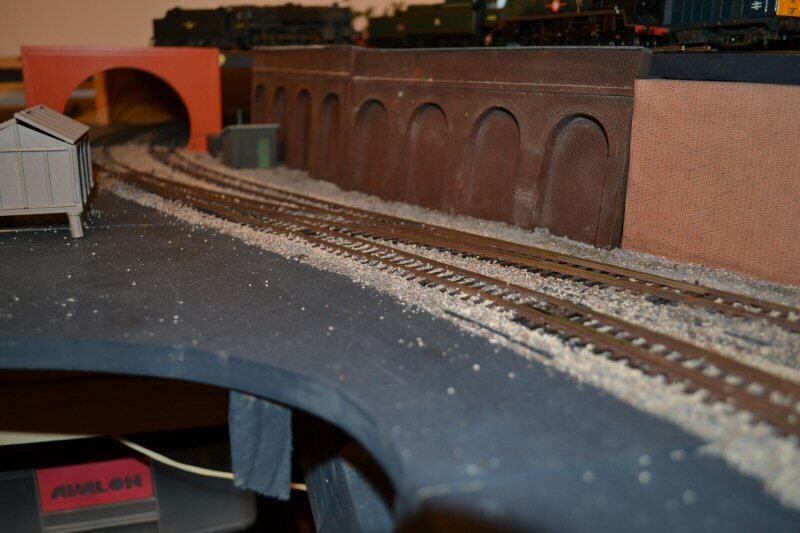 The bridge in the foregound and tracks curving round to the left are purely to give a rough idea of the alignment of the upper level tracks when I get to lay them properly. 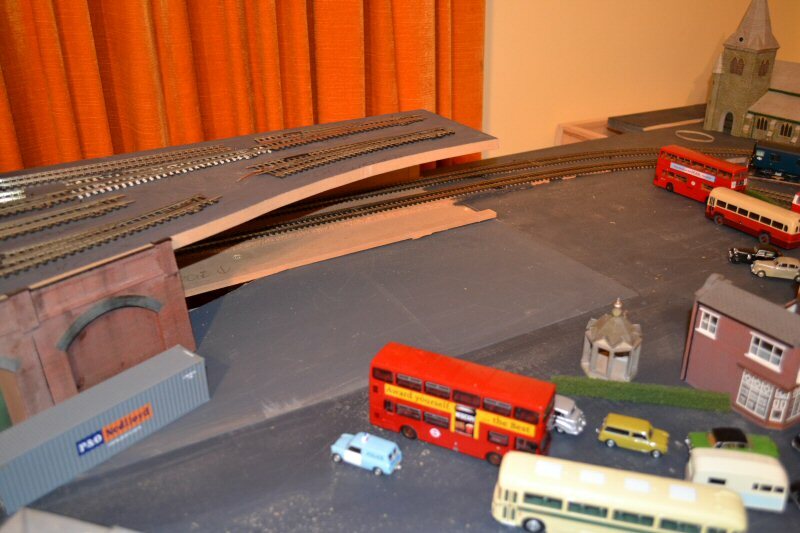 The bridge will, of course, be double tracked. The "proper" curves will be a little gentler than the third radius ones I have used for show. 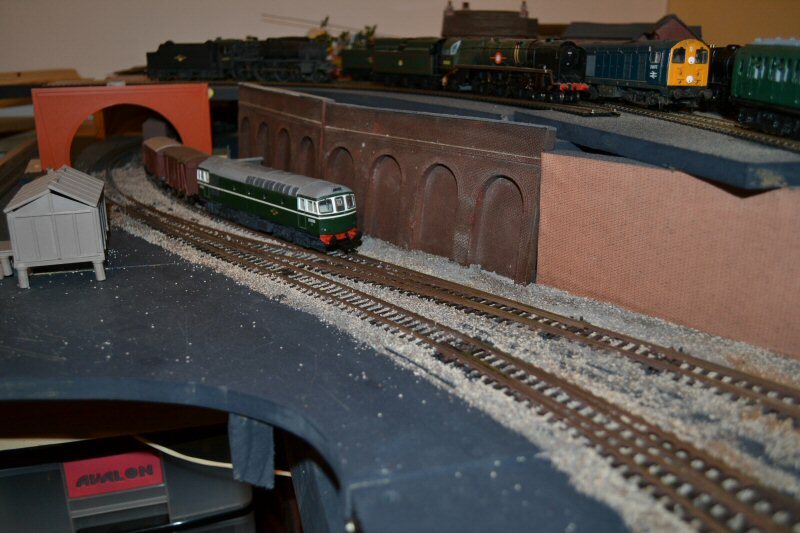 Here's another shot but with the green 2EPB still running-in - it had been running continuously fo a couple of hours by this time but still exhibited a little tightness that was not apparent in any of my othe EPBs/CEPs. Here are a couple of overall views showing how it now looks, as prepared for the BRMA meeting. 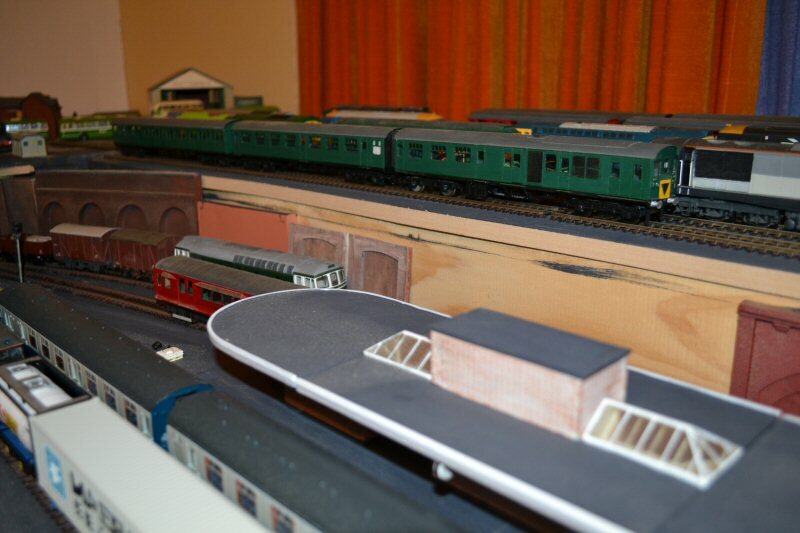 Once again, the green EPB is travelling around. And finally (for now), the temporary switch panel. It is a piece of 20 thou plasticard, hot glued to the boards, with the two DPDT switches screwed in. I printed up labels this morning to help avoid any confusion. My thanks to Jeff (and Agnes) for hosting today's gathering at short notice. 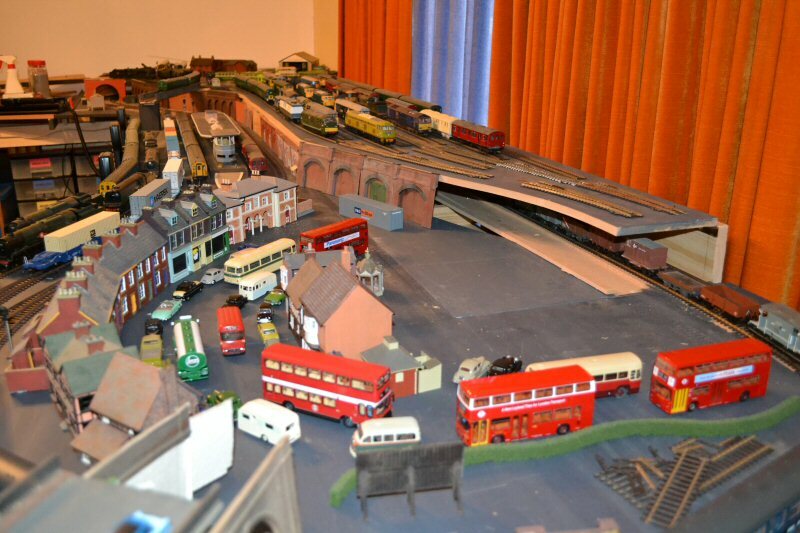 My attendance was also only possible at very short notice but it's always good to meet fellow modellers and share tips, thoughts and friendship. 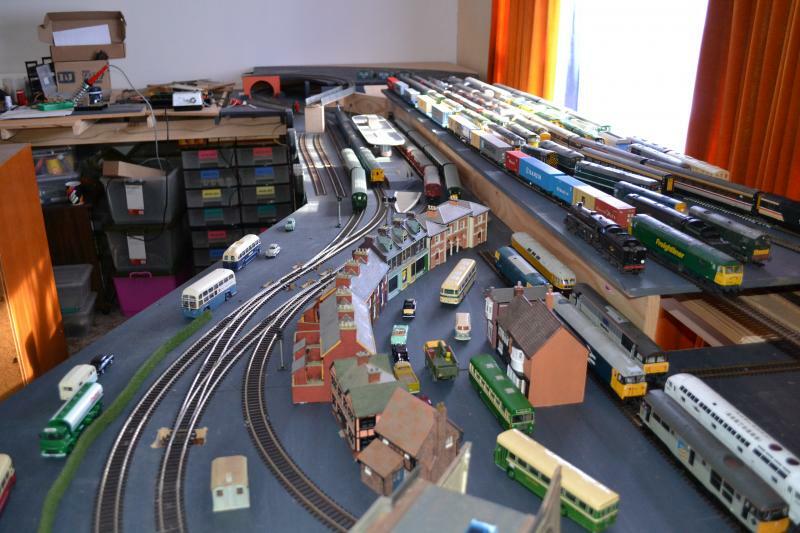 Seeing the layout in operation is also a bonus which we cannot replicate through the medium of an online board. Highlights for me would have to be the CP stock (underground train) which is an extremely competent build and runs very smoothly, together with the variety of SR EMU types present. There are some good looking kits under construction as well. It was a pleasure to see you again, Rick. As host, it is always difficult to catch up with everyone at these meetings. Unfortunately, I have rather too many half-built projects, although several of them are actually runnable even though they are incomplete. 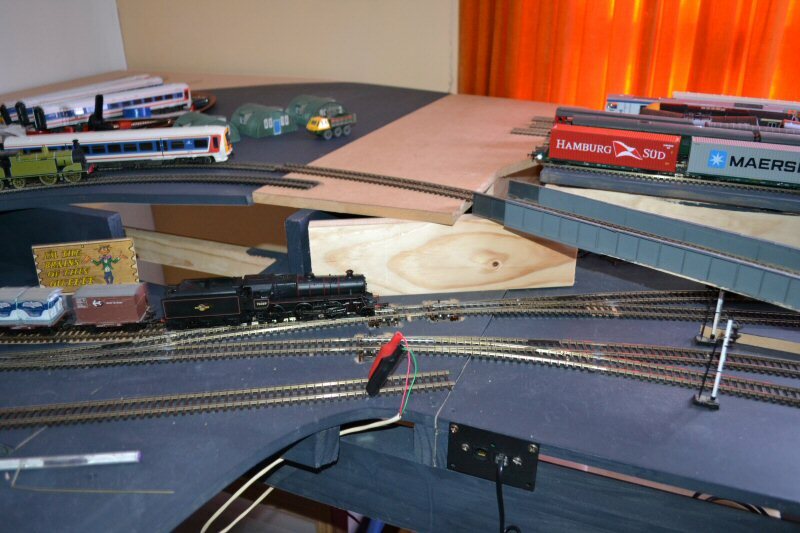 Well done Jeff, Your railway is coming along nicely and I am glad you had a good meeting with your railway group. No sign of your furry friend Toby, Is he banned? Toby buried himself in the spare bedroom. He tends to be a bit shy around strangers, although he did surface briefly to have some food in the kitchen. He kept a wary eye on the visitors though, ready to scuttle off to his room again if anyone moved something as small as a finger. He hasn't been banished yet as he has, so far, proved not to be destructive around the trains. I have now been running trains and leaving them to run for several hours a day over the last week. 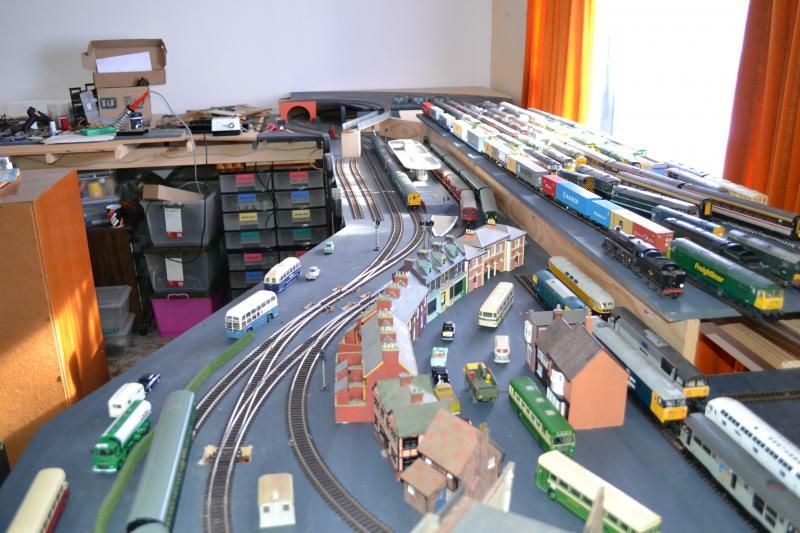 This has allowed me to sort out any troublesome locomotives or stock. Thankfully, I have only had to set aside a few items for fixing, anything from lubricating them to sticking coupling mechanisms to dirty or faulty pickups. I can now confidently leave things running and walk away, coming back later to find all is still well. 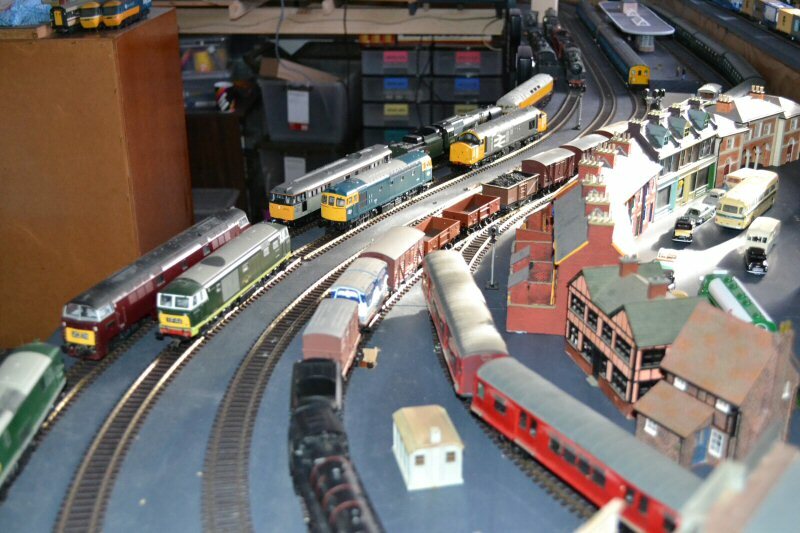 It has been fun running a variety of stock, old and modern, some of which hasn't had a proper run for quite some time. Today, I cut a piece of MDF and some supports to fill the upper section between the end of the lifting section of the fiddle yard and the fixed corner board. It is not yet screwed down nor is it painted. The train running past has a Bachmann BR Standard class 4 2-6-0 76069 hauling a short mixed goods train of the 1960s. Included at the end of this train is my kit-built SR "Pill Box" brake van, of the type that was recently announced by Bachmann for release this year or next year. Mine is a Cambrian kit. 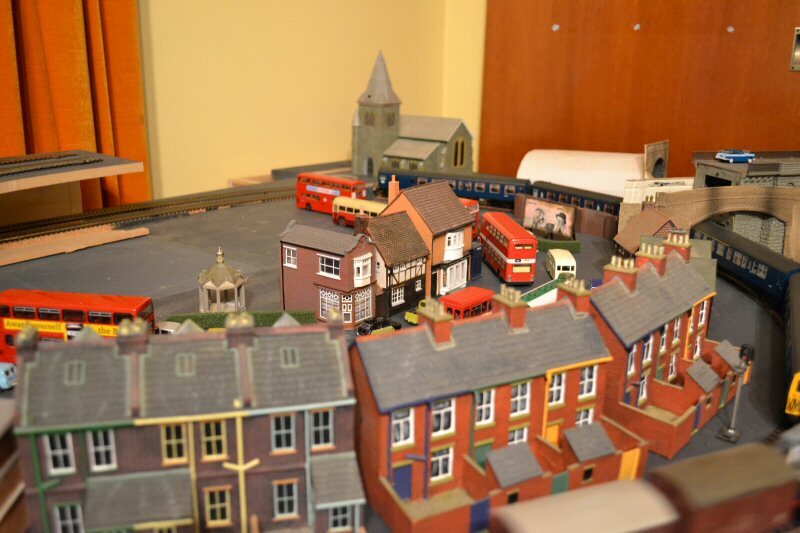 Also, the same train, as seen from the other end of the layout. At the time, I had a Hornby class 50, 50 035 "Ark Royal" running in the other direction with a blue/grey set of Bachmann BR mark 1 and 2 stock. The overbridge is there purely to give an idea of the upper level track alignment. Earlier on, I was running several Hornby/Lima hybrid class 73 Electro-Diesels. One of these, E6012, in the early BR blue with grey skirts is seen on an engineers train of ballast wagons, topped and tailed by "Shark" ballast plough brake vans. The heavily weathered one at the end of the train is also a Cambrian kit, and just ahead of it is a kit-built "Grampus" wagon with no markings on it (must get around to doing that!). 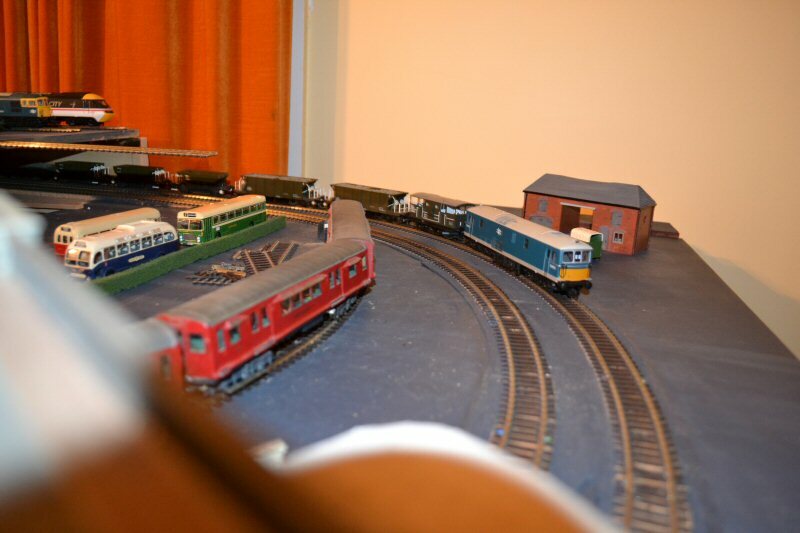 The same train at the other end of the layout. 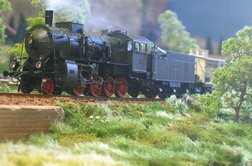 And the one I thorughly enjoyed running as being a little different; the LSWR M7 0-4-4T, 252, with a three coach SR Maunsell set (Hornby) in fully lined out livery. It's coming along really well Jeff. Having the ability to leave things running and knowing that they will do that and not simply stall must be a big step forward in both the rolling stock and civil engineering departments. Work is still continuing but at a slightly more "relaxed" pace. This is partly due to my having a pinched nerve in my neck which has affected my right arm and index and second fingers. I am avoiding the heavier carpentry work but I have been busy painting the rails and adding card covers over all the baseboard holes under the points. I have completed painting around 80% of what will be visible track on the Underground. I will be measuring up and ordering some code 60 rail shortly to do the third and fourth rails (more @#%$^@&$ rails to paint!!!). Doug, who did the major part of the board construction, is currently winging his way to Britain and Europe; included in that trip is a visit to the ScaleForum exhibition, so I have given him some money with instructions to purchase some of the ScaleFour third rail end ramps (he is a member of that society anyway). 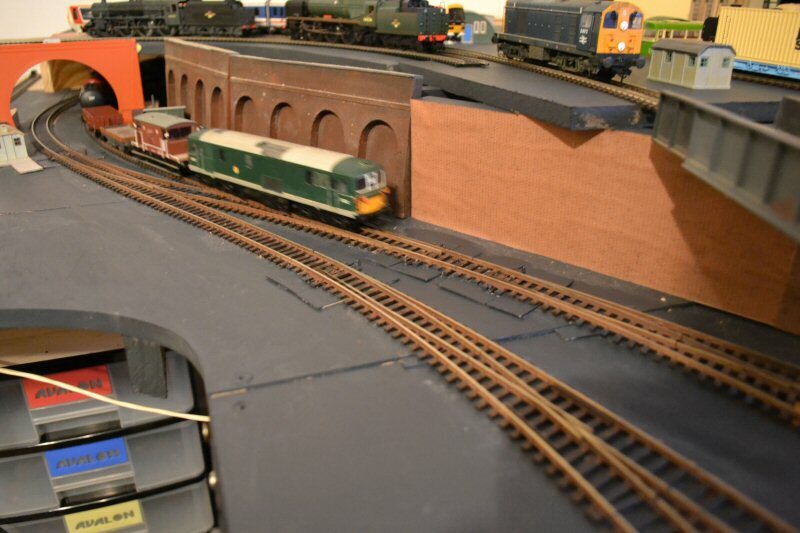 The other minor improvement I have made, however temporary, is to prop some of my brick retaining wall mouldings up at one end of the station area, towards the tunnel mouth, plus pasting some old Superquick brick paper to the piece of wood acting as a bridge support. This gives me a better backdrop for photography and I have a few more pictures sitting in the camera awaiting upload (coming soon to a monitor near you!! ). 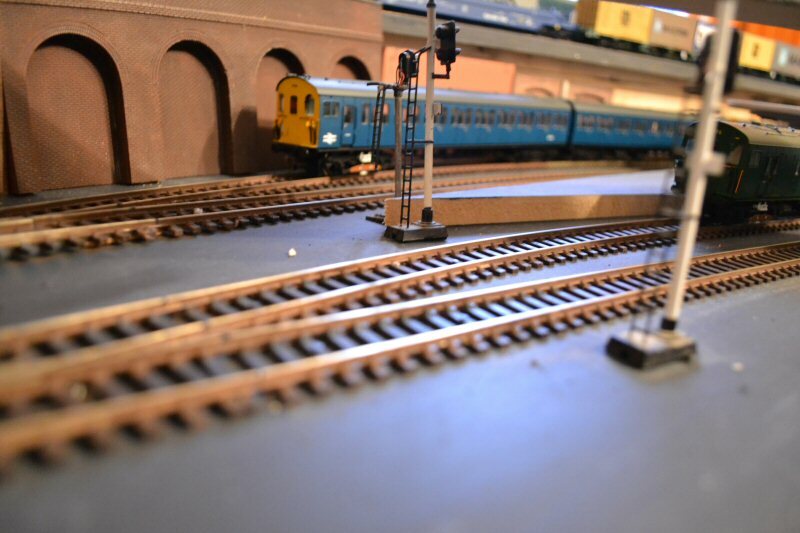 As soon as I figure out how to extract them from the video camera, I also have a couple of videos taken on the layout. My desktop computer is currently blue-screening (yes, that's right, the dreaded BSODs ... Blue Screens Of Death!) due to a hardware fault that I haven't quite pinned down yet. I am working through a process of elimination and I strongly suspect it is the power supply unit at fault. The problem here is that most of the software I need for extracting the video and editing it is on that desktop computer. I am posting from the laptop. which is a competent computer but doesn't have all of my really powerful software (I deliberately keep it less cluttered and encumbered as it is also used occasionally for my work in IT Support at a high school). 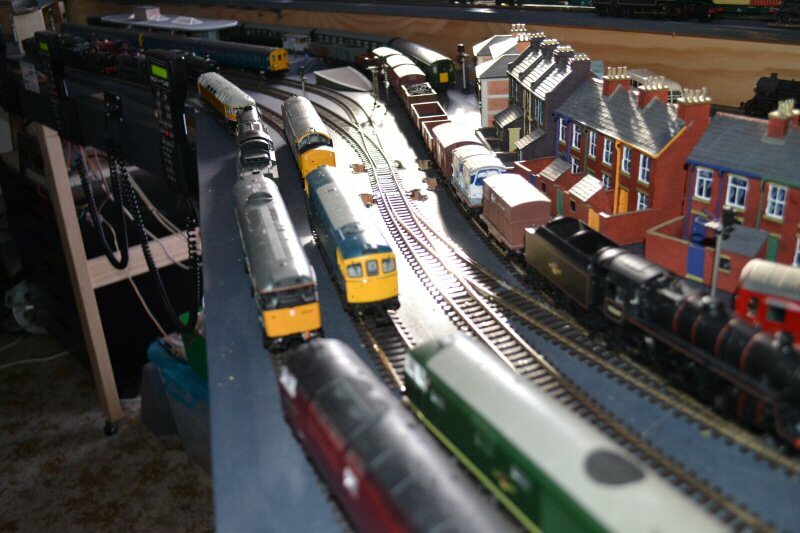 Even as I type this I can hear the trains running happily around the layout - I have turned the sounds on for both the BR Standard 5 and an Electro-Diesel currently hauling Pullman train and a slightly anachronistic tanker train, respectively. 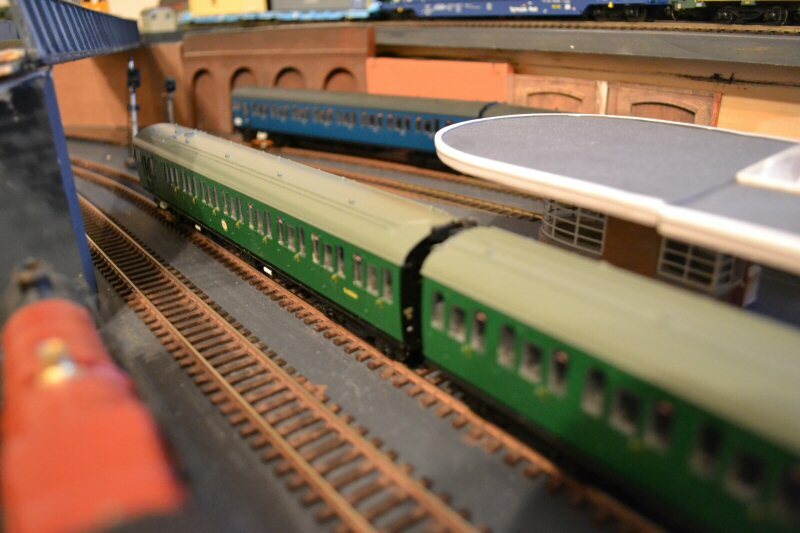 A few days ago, I left the Hornby Arthur Sir Gawaine running with two utility vans and a Maunsell 3-set while I went off and did other things. I came back an hour later to find it still running perfectly well with the locomotive and utility vans pushing the 3-set of coaches around - the coupling between the last utility van and the coaches had obviously let go at some point and the engine had come around and buffered up (no coupling on the front) and just kept going. The sprung buffers on both locomotive and coaches must have absorbed the impact and there was no sign of buffers overriding each other or locking, which means my transition curves must be working properly (which is nice to know!). That is tempting fate Jeff, leaving your DCC train running all by itself - you must have heard of Murphy? Here are a few of the photos referred to in my previous post. 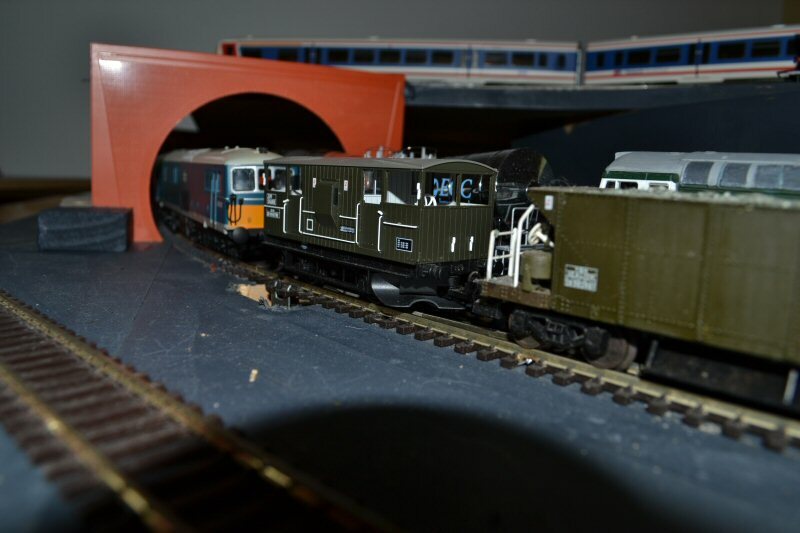 Firstly a night shot with the Bachmann 2EPBs occupying the station. 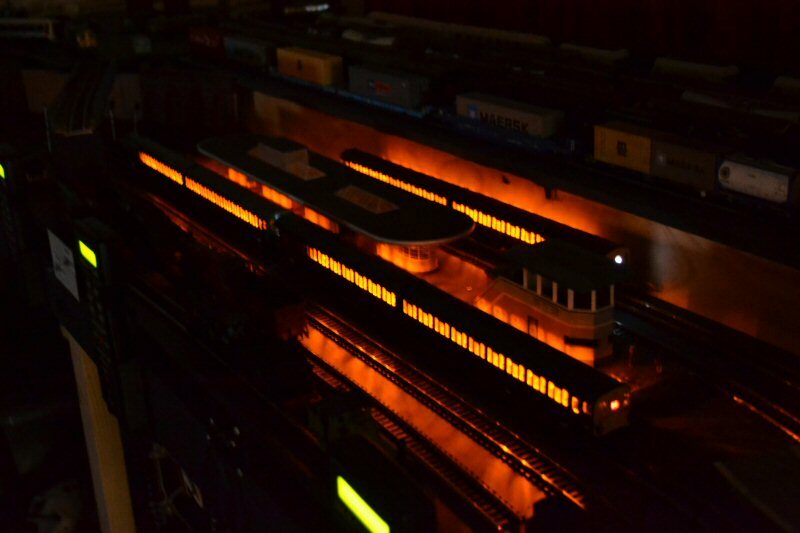 Also running were a Bachmann 4CEP and a train of Hornby Pullmans, all with lights on. The rear one is running solo but the front pair of units are running in multiple (consisted). Next, a Lima Electro-Diesel but fitted with a Hornby mechanism and Howes' sound, hauling a train of tank wagons from a slightly earlier era. This shows the newly painted track and also the new cover plates of card over the holes where the point motors are fitted. I have also shifted the temporary programming track so it is less obtrusive. 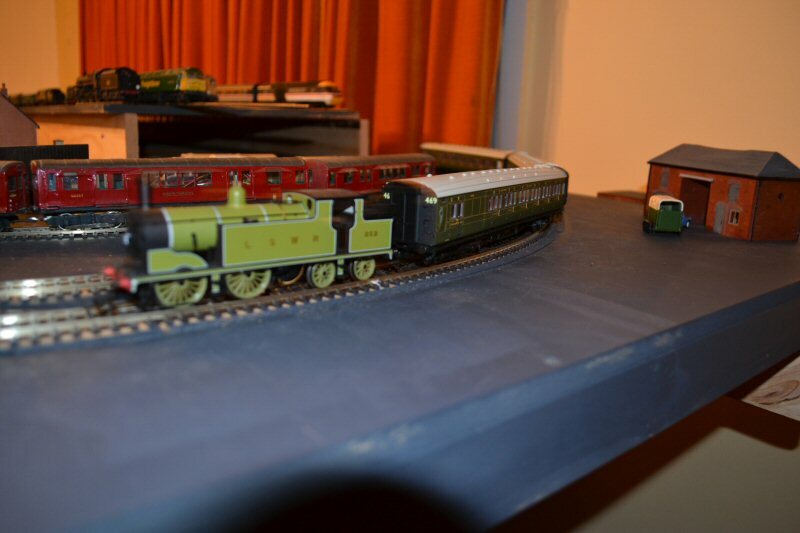 And now, two shots of the Bachmann 2EPBs, also showing the painted rails, etc. 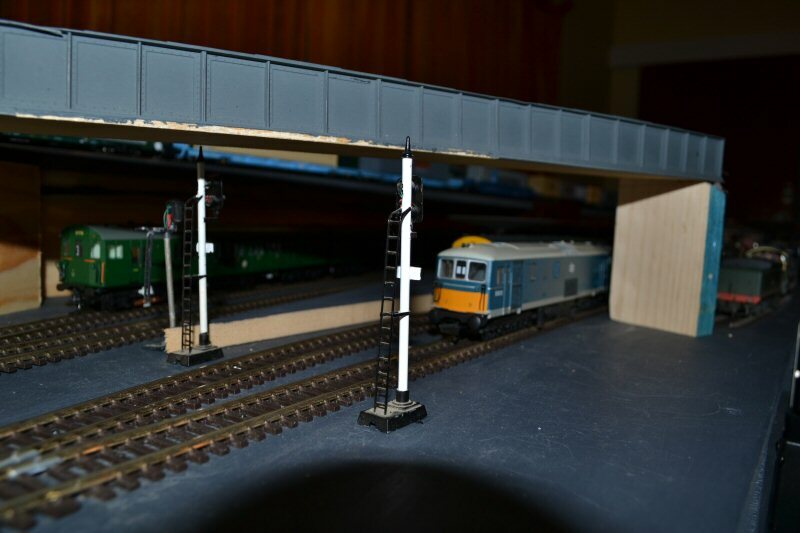 Painting the rails has alerted me to one advantage of wiring the points fully for DCC with the microswitches: I can paint the point blades and stock rails completely without having to worry about keeping any electrical contact between them. During the last week, I decided to try out some new ballasting materials on a small section at one end of the LT circuit. I'm not yet happy with the result, although this is only the first layer and is a bit uneven anyway. I think I need to darken the colours a bit as well as weathering the ballast. Then, today, I decided to get stuck into trimming the upper level back to its final shape. It was out with the jigsaw, after first clearing all the stock and track off the upper boards. I had already marked it out with a pencil a few months ago and I also enlisted some help from my wife to hold the hinged section open while I trimmed off the vertical support board. 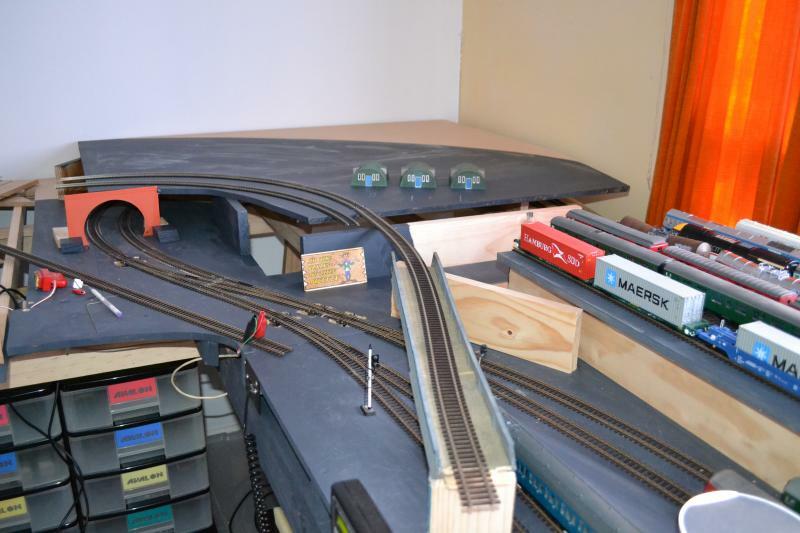 I also trimmed a bit off the overhang where the LT track loop runs through behind the island platform line. The next job will be to paint the hurricane grey over all the newly exposed timber. The majority of the triangular end section became the lower level in-fill as shown in the next photo and the last few shots. There is my usual mixed-up period combination of trains and road vehicles. Jeff, that often happens when the Tardis is used instead of the 1955 Morris Minor to travel around in. Ron, the Tardis is sitting right next to that Volvo Ailsa bus in the photos! I have now painted the exposed woodwork and experimented with more buildings and their positioning. The village area will be on a rising gradient towards the rear but, even on the flat, I can get an idea of what I need to fit in.